Six weeks ago Mark and I flew into Amsterdam to begin our teaching tour of Europe, sponsored by Tahe Marine. Today, as we transferred the somewhat spread out contents of the van into our two travel bags, it became clear that the tour has reached its end. 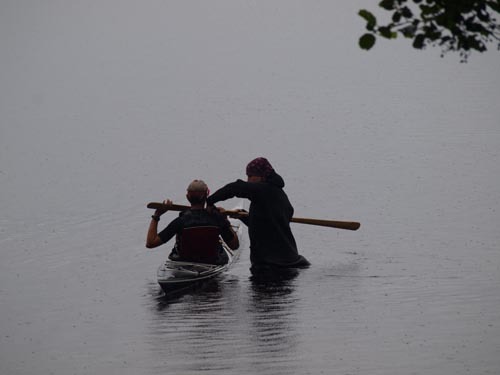 The six weeks of teaching, paddling and exploring went by very fast, and we leave with new friends and some great memories. 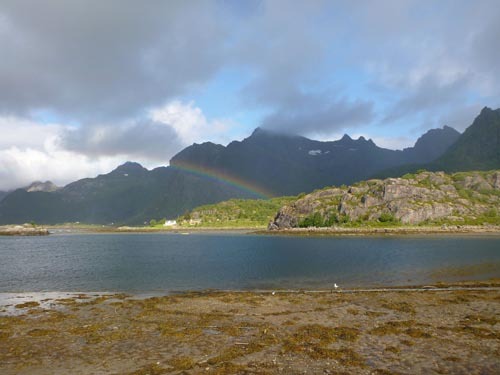 The final week of the tour first took us from Lofoten, Norway to Mora, a fantastic town just south of the center of Sweden. 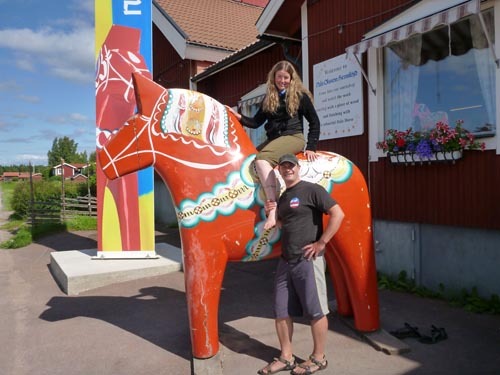 Mora is known for many things, including its midsummer festivals and its locally made Dala horses. We were warmly greeted and soon felt right at home in a fantastic cottage by the lake. 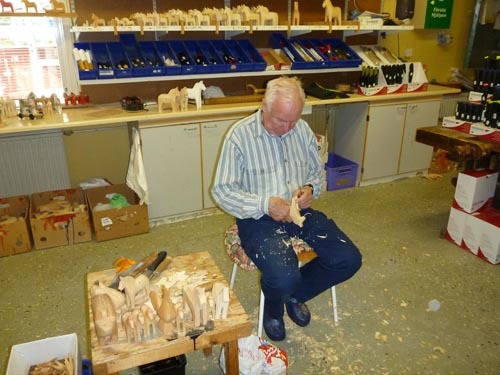 A man at the Dala horse factory demonstrates how the horses are made. 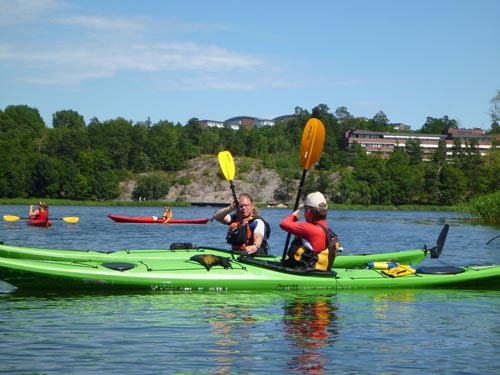 In Mora we taught three classes on a gorgeous lake and then had an opportunity to explore the following morning. Our wonderful host Magnus took us to the factory where the Dala horses are made, and we watched as staff turned blocks of wood into beautifully painted horses of many sizes. Hanging out with a Dala horse. 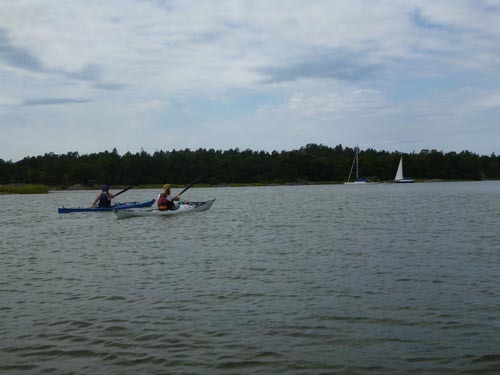 After that we went to Orsa Gronklitt, a bear park not too far from our cottage. 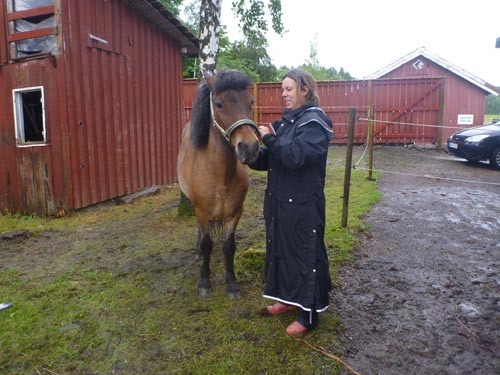 It was spectacular, and the animals looked happy and healthy. They had tons of room to roam, and many of the viewing platforms were over the massive enclosures. We watched a Kodiak bear take a bath, a couple of snow leopards playfully battle for who got to sit on the higher stump (the smaller one won) and a couple of polar bears nap on rocks by a large swimming hole. 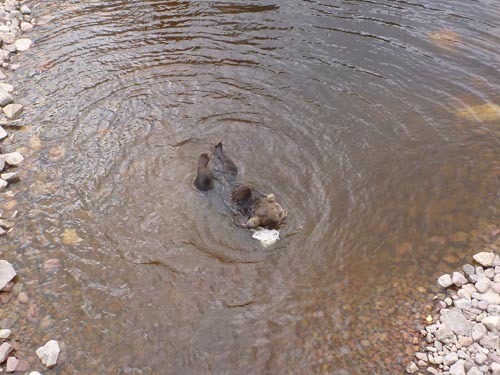 A Kodiak bear takes a bath. 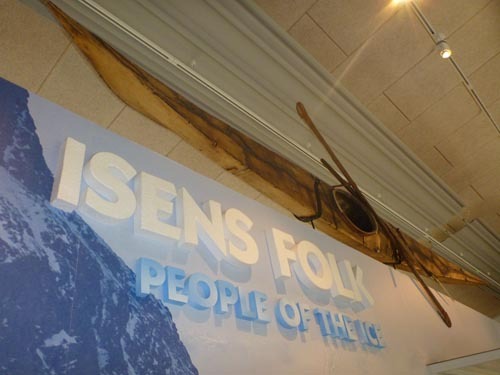 A traditional kayak in the polar display at the bear park. 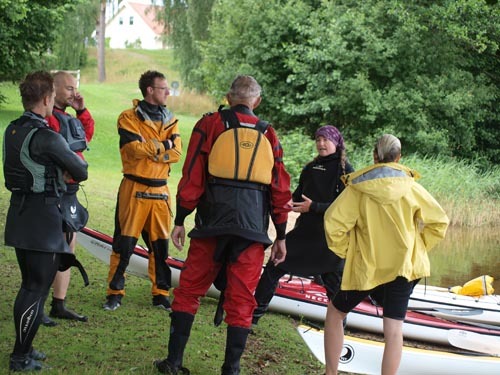 After Mora we headed to Nynashamn for a weekend of classes. 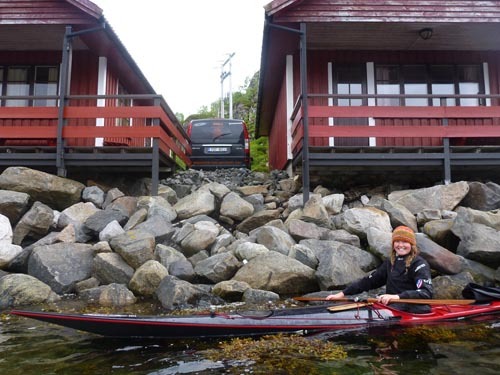 We met with Pelle and Carina of Nynas Kajak, and they set us up in a room in the adjacent resort hotel. 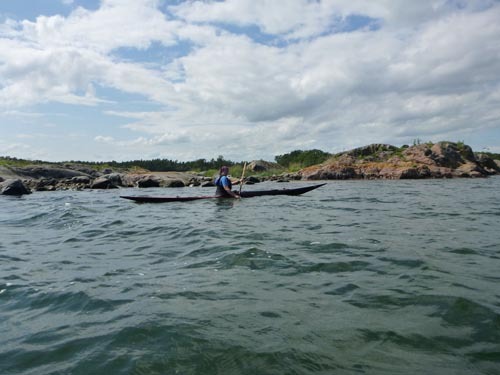 We had a day off before classes began, and all four of us went paddling around the archipelago. 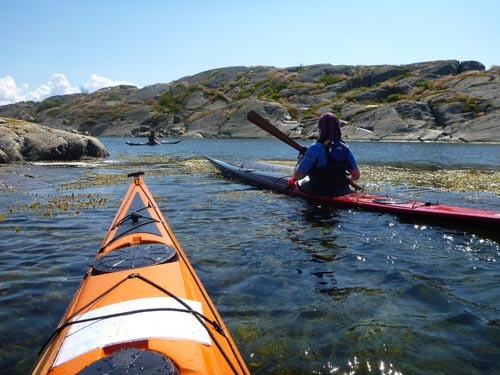 We had a wonderful time exploring the incredible surroundings by kayak and ended the day with a soak in the resort’s hot tub and then a fantastic dinner at a boat restaurant in the lively harbor. Sky works on his forward stroke. 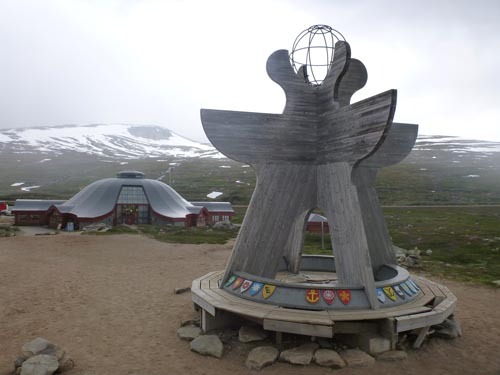 For the next two days I instructed two rolling classes and two Greenland technique classes. 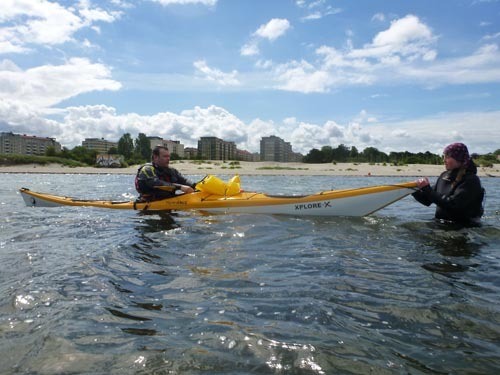 Mark instructed a two-day BCU 3 Star Training. We had lots of fun with our students, and everyone’s spirits were high, perhaps due to the incredible weather and the resort that surrounded us. 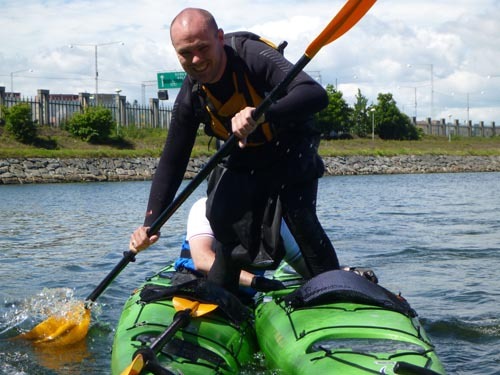 After saying our goodbyes and feeling relaxed from several soaks in the hot tub, we made our way back to Marsta to catch up with event organizer Mats von Wowern of Green Island. 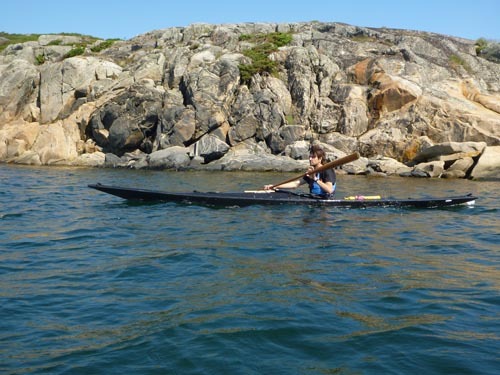 Pelle provides local knowledge of the archipelago. 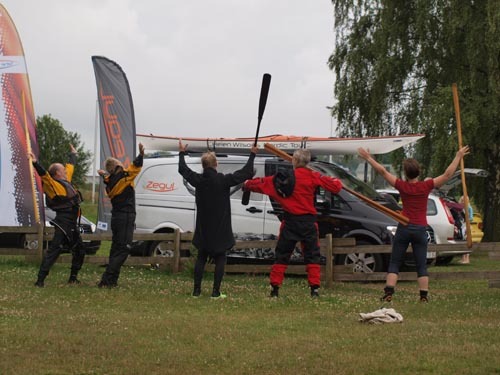 Thanks to Mats, Tahe Marine and all of the wonderful people that kept us fed and watered as we made our way across Holland, Germany, Denmark, Sweden and Norway. 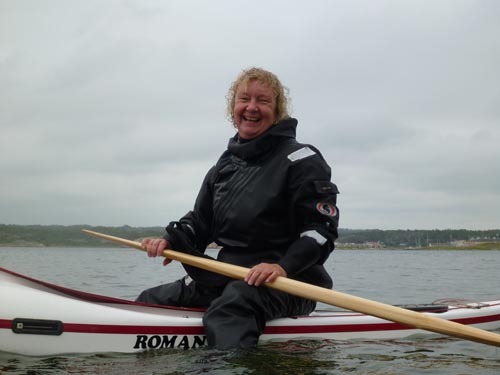 Thanks also to the paddlers that attended our classes. Without you there wouldn’t be a tour. We hope to see you all again next year! Tomorrow morning we head back across the Atlantic to Salt Lake City for the Outdoor Retailer Summer Market. If you’re in the area stop by the Tahe Marine booth and say hello. Last week we crossed the Arctic Circle in Norway, and after stopping to play in the snow for a few minutes we headed even further north to Lofoten, a stunning group of islands off the coast. 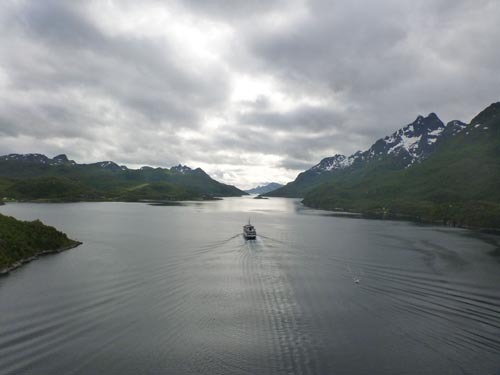 As soon as our ferry pulled into Lofoten, the pace of life seemed to instantly slow down. It was as if the islands themselves were telling us to relax. 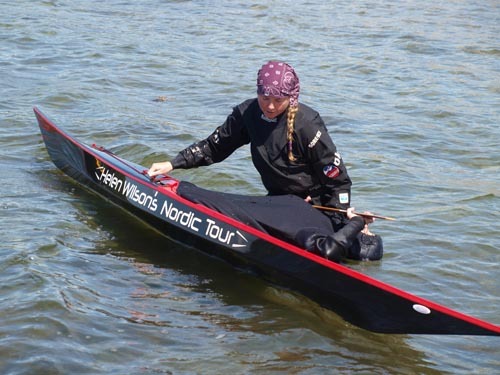 We met with Jann of Lofoten Kajakk and talked about the classes that we’d be running for the next two days, and then we settled into our fantastic cabin, right on the water’s edge. 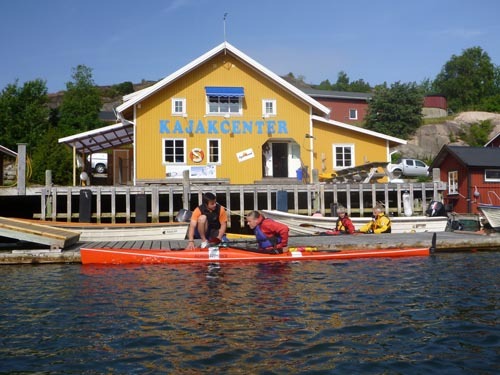 Over the next few days we ran several classes, tried lots of tasty food and explored the islands by foot, by kayak and by car. 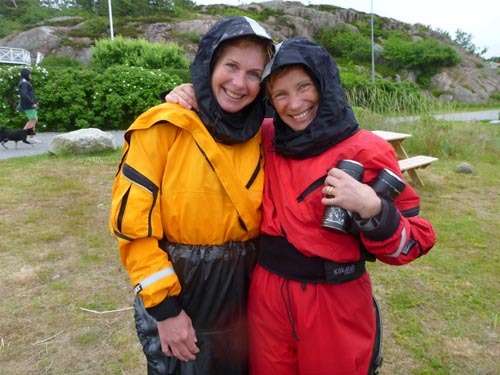 Two evenings we found ourselves in Henningsvaer, a popular destination for rock climbers. Tents were scattered all over, and a close look up at the steep rock faces revealed more and more climbers taking advantage of the 24 hours of sunlight that are available this time of year. We didn’t bring climbing gear this time, but we enjoyed the Climber’s Cafe, a fun hang out spot with hearty food and a casual atmosphere. A view of Lofoten from one of the many bridges. 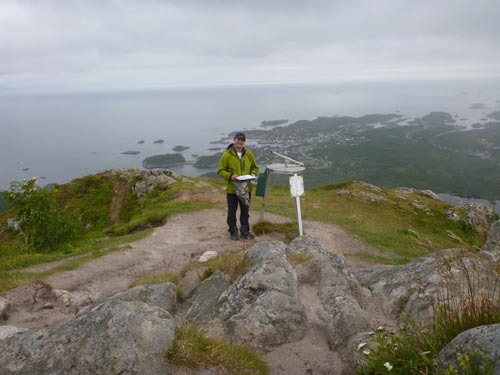 Later in the week we hiked up a mountain to enjoy a bird’s eye view of the surrounding archipelago. 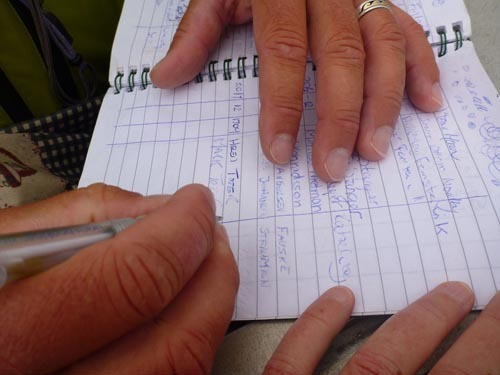 At the top of the mountain was a logbook, and we keenly added our names to the list of people that had pilgrimaged to the top of the popular freestanding mountain. Mark signs the log book. We spent a day exploring by car, stopping at scenic spots to take pictures and to take in a few breaths of the fresh and icy air. 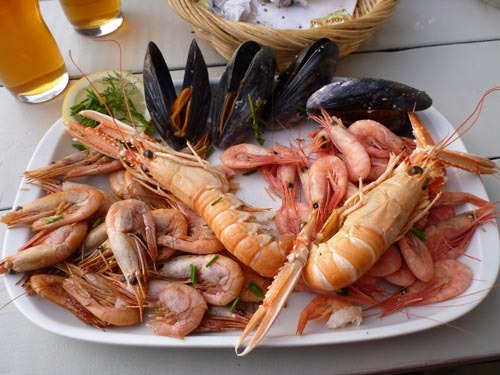 We also got a taste for the local food, and munched on fresh shrimp, whale, Norwegian cheese and other delights. A rainbow over the water. 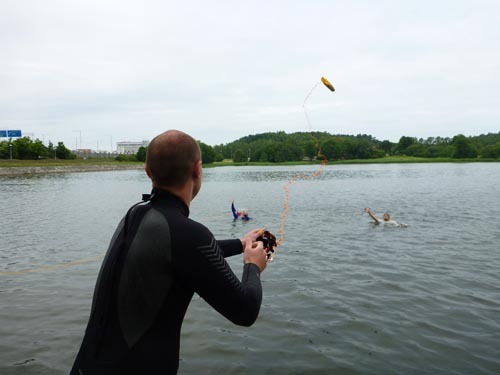 Of course there were classes as well, and the snow covered mountain peaks provided a stunning background for rolling classes in the crystal clear water. 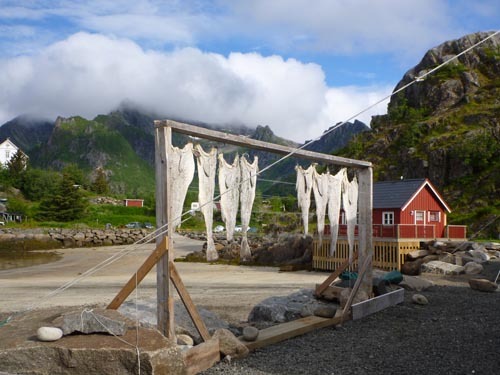 Cod (the main fish in Lofoten) drying in the sun. 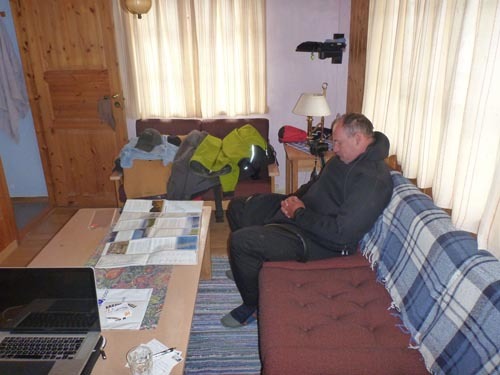 Mark enjoys a lunchtime nap in his tuilik. Yesterday we took a three hour ferry ride back to the mainland. 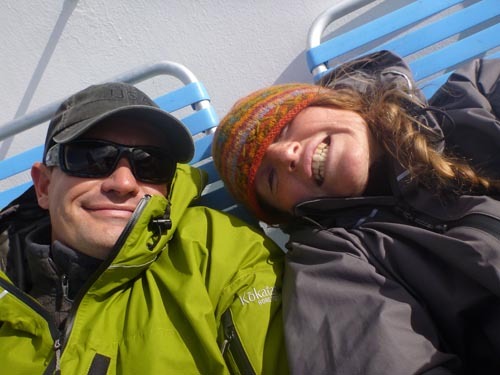 We sat on the back deck of the ferry feeling the cold air on our faces as we watched the mountains of Lofoten slowly disappear. 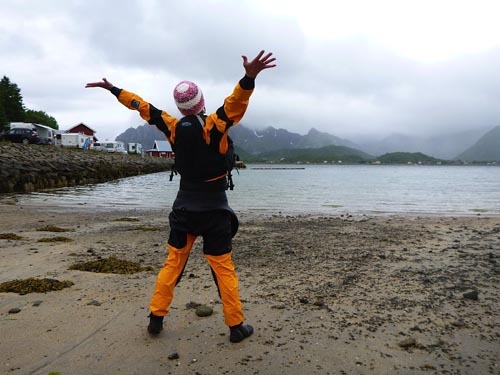 Zegul Woman appears in Lofoten. This morning we woke to a fresh sprinkling of snow in the mountains on the mainland, and after an early breakfast we packed up into the van again to begin the long journey south for classes in Sweden later in the week. Enjoying the crisp air from the ferry. 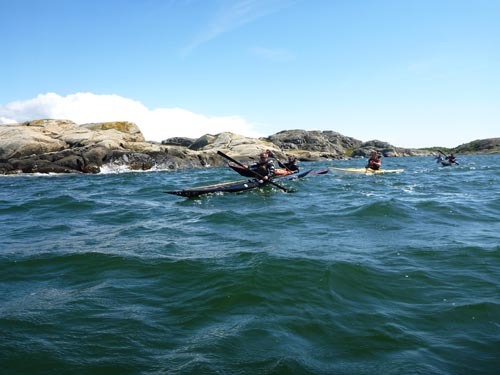 After a week of classes at Green Island in Stockholm, Mark and I had a few days off before our next classes in southern Sweden. We decided to head down the coast slowly. First we stopped in Stegeborg, a small town nestled in the hills. The town consists of a hotel, a restaurant and a castle. The hotel links to the restaurant and castle by a two kilometer walking trail through the hills. We found it to be a wonderful place to relax, and the self-guided audio tour of the castle was a fun treat before we headed south to S:t Anna. 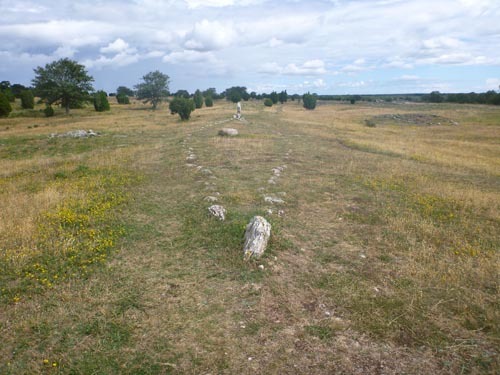 S:t Anna is a region on the east coast of Sweden that is well-known for its stunning archipelago. 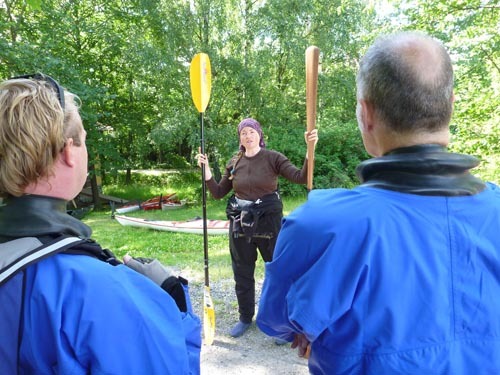 We were warmly greeted by the crew at S:t Anna Kajak and given some local knowledge of our surroundings. 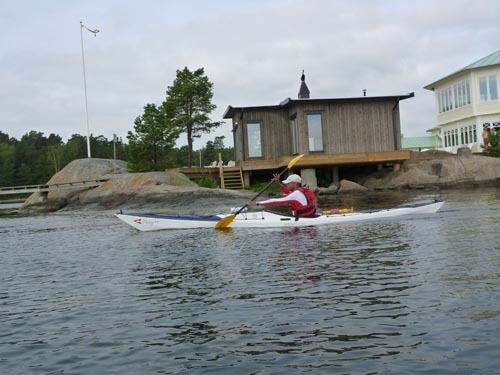 We spent the afternoon playing, by kayak, in the archipelago and enjoying the scenery. 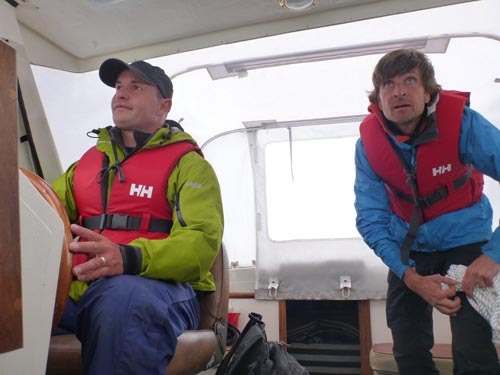 Upon our return to shore, we chatted more with the crew while cooling off with an ice-cream. 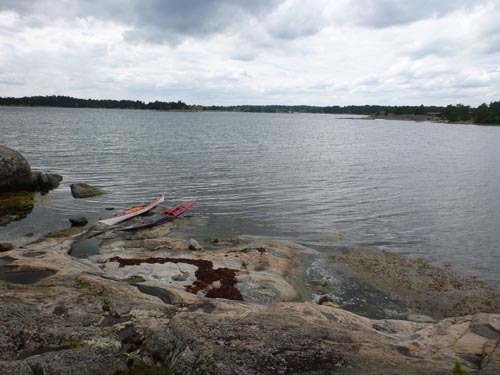 A rest stop in the archipelago. 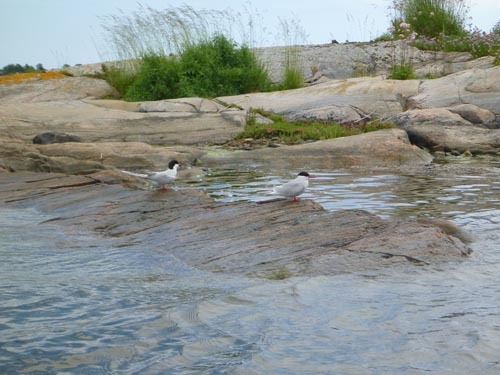 Abundant wildlife in the archipelago. 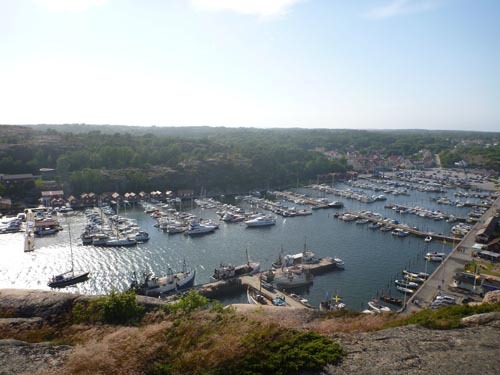 Next we continued south to Oskarshamn, a harbor town with ferries that run to the two islands off the east coast. 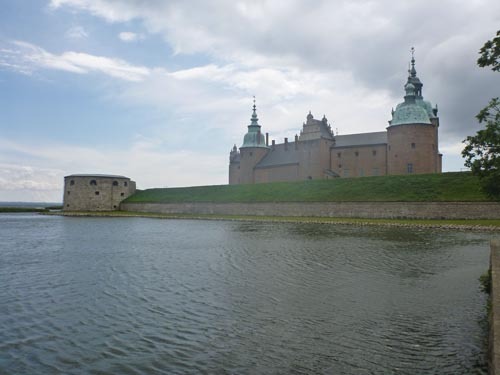 We stayed the night there, and then traveled further south to Kalmar, a charming town with a lively square and a large castle of its own. We spent the afternoon exploring and then drove across the bridge to an island called Oland. 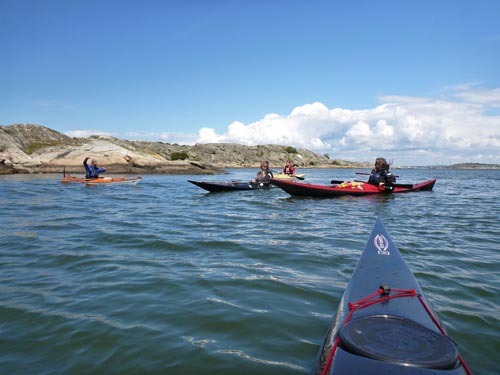 Once on the island we headed north and took in the view of the mainland from Borgholm’s fun harbor before meeting up with Johan Wirsén, a kayak designer (kayaks such as the Tahe Greenland and the Wind can be credited to him). Johan is also a good friend of ours, and it was fantastic to see him. 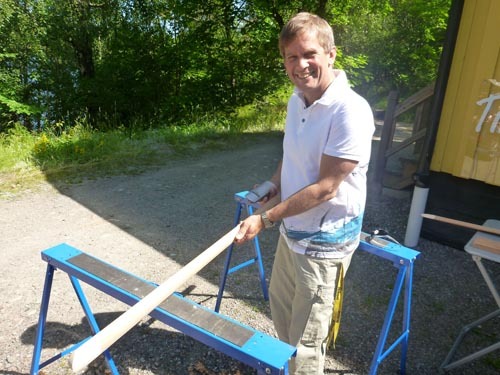 We spent the day catching up with Johan, and the following day he took us on a tour of Oland. 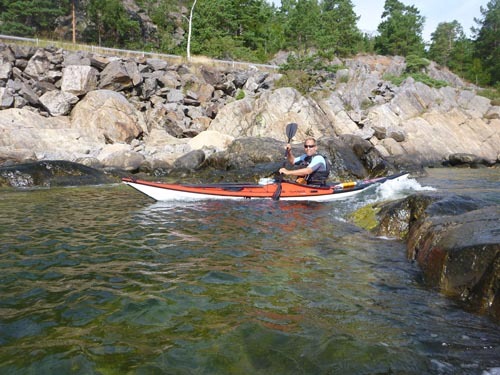 We visited old graves, churches, village ruins, numerous beaches and looked over Johan’s large collection of kayaks. We also stopped at a tasty seafood restaurant for herring, a popular fish in Sweden. 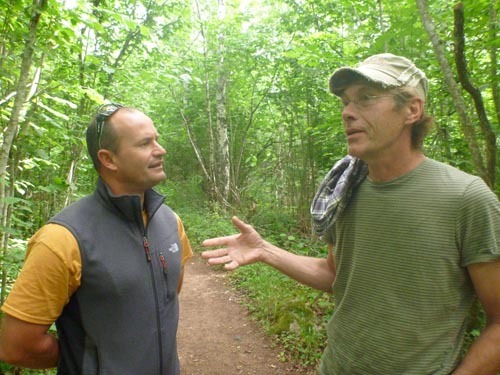 Johan shares some local knowledge with Mark. After a wonderful visit with Johan we made our way south to the town of Karlshamn. 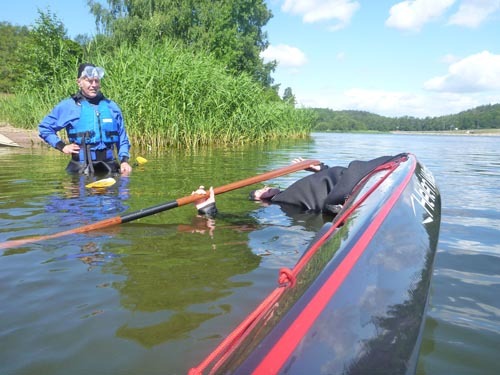 We ran three classes on a gorgeous (and warm) lake amongst the company of a fantastic group of people. Talking about the finer points of rolling. 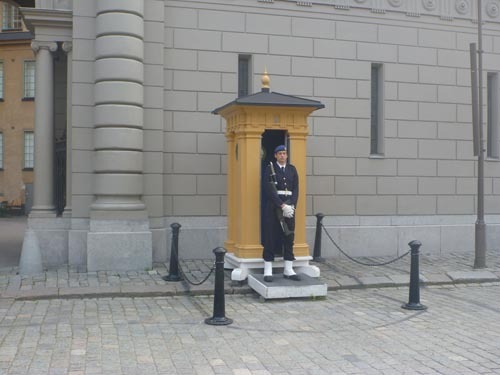 The next day we went to Malmo, a town in southern Sweden that sits on the border of Denmark. 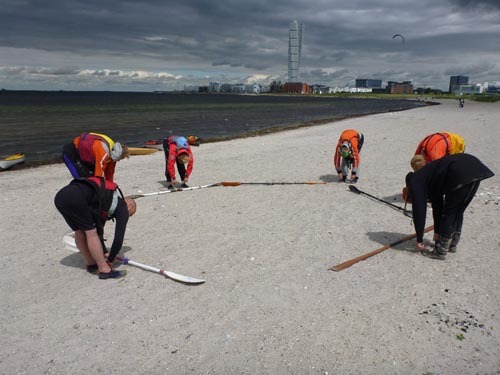 It was lots of fun to run classes with a spectacular view of Copenhagen in the distance, while being surrounded by Malmo’s unique architecture. After the weekend of classes we made our way up the west coast to Billdal and visited with friends Mikael and Jessica before hopping in the van to begin the long drive through Norway, to Lofoten, an area just north of the Arctic Circle. 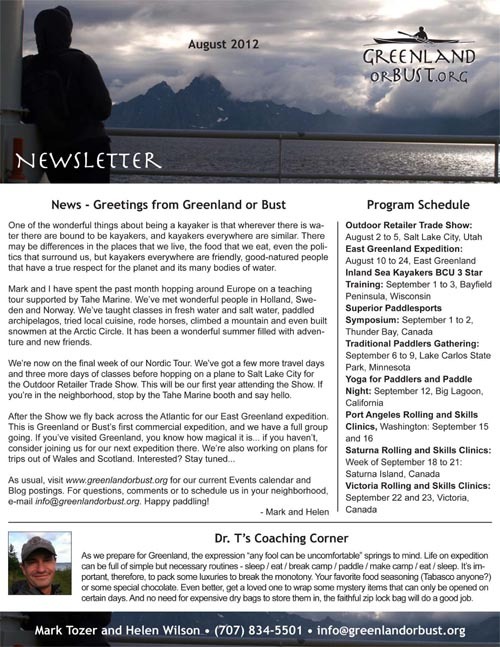 After classes in Grebbestad, Mark and I headed to the east coast of Sweden for the week-long event Greenland Academy, held at Green Island. 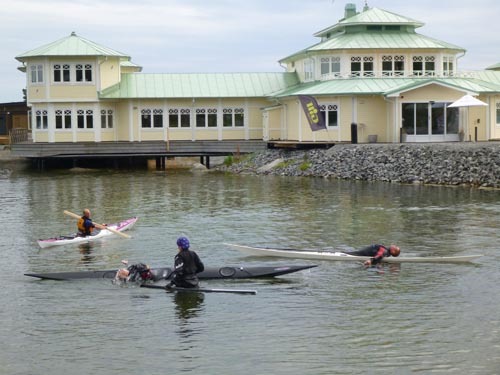 Green Island is a fantastic shop on a lake on the outskirts of Stockholm, and not only does it provide kayak rentals and sales, but it sells ice-cream as well. 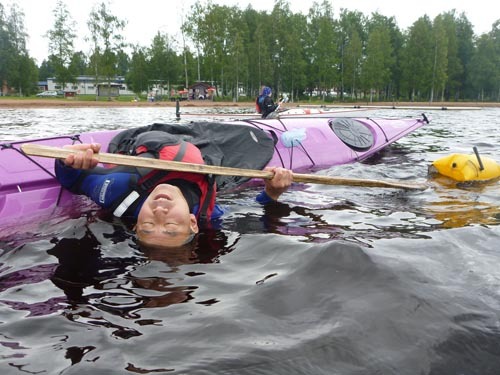 With temperatures soaring in Sweden this week, both kayaking and ice-cream were very popular. Per makes one of his own. 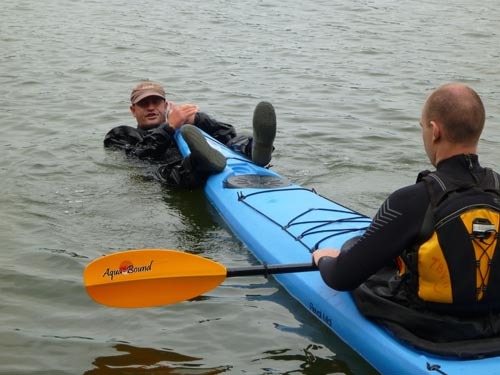 Throughout the week we instructed in multi-level rolling, strokes, maneuvers, rescues and teacher training programs. 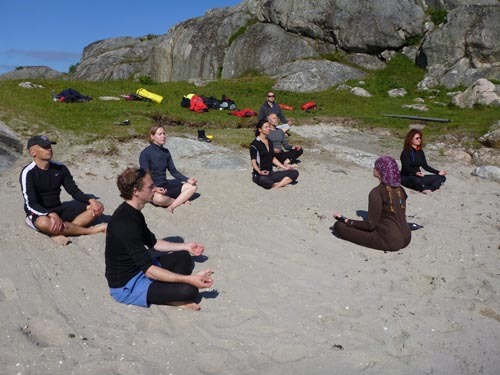 We also ran a daily Yoga for Paddlers session. The staff at Green Island were lively and wonderful, and we thank everyone for their hospitality. 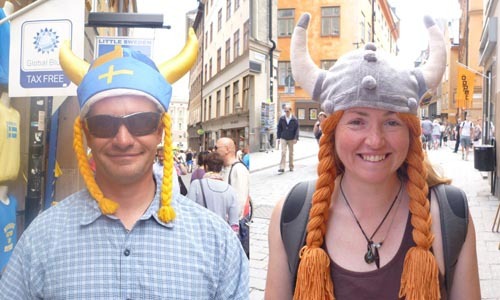 Mark and I also had the opportunity to spend a little time exploring the fabulous city of Stockholm. We rode a train to the heart of the city and spent a day exploring the Old Town and peering over bridges into both flat and whitewater canals that run through the city. We spied an amusement park and rode a ferry over to it. Grona Lund was lots of fun, and we rode one roller coaster after the next and played in the best fun house that I’d ever been in. We ended the day at Aifer, a tasty Viking Restaurant located in the Old Town. 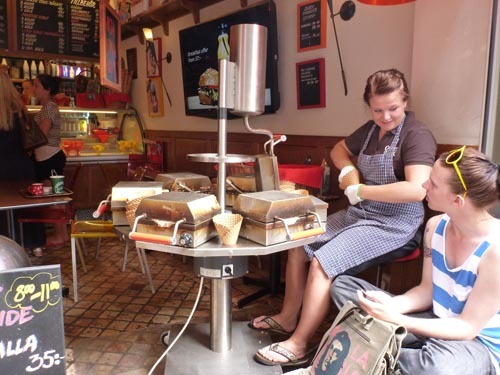 The restaurant was great fun with the staff dressed in Viking clothing. Whenever diners would enter, their origin was announced to the entire restaurant, who would then clap before continuing to eat at the long, decorated communal tables. Playing in the Old Town. 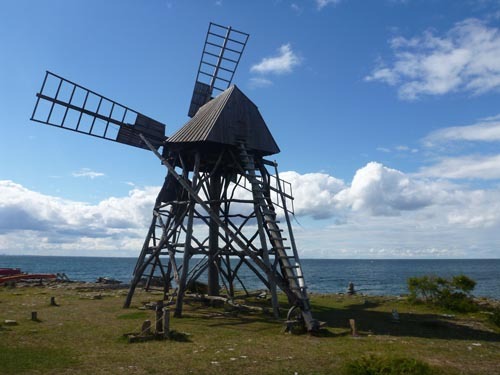 Today we head down the coast for a couple of days of sightseeing before our next classes in Karlshamn. 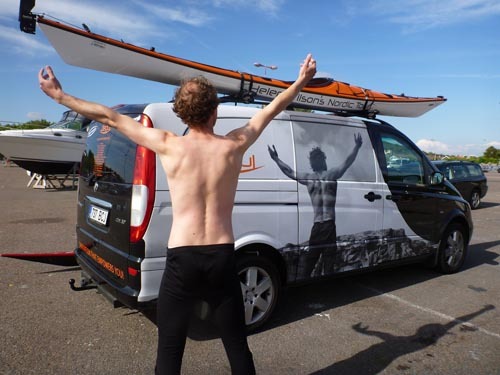 On another note, Zegul Marine has provided us with a fantastic van for the tour. The van is decorated with our tour schedule, several logos and a picture of the back of a man that we’ve been fondly calling “Zegul Man.” Our students have begun posing next to the van in the “Zegul Man pose.” We’ve been putting these pictures on the Zegul Marine Facebook page. We encourage YOU to take your own pictures in the pose and post them as well. Or you can send them to us and we’ll post them.